This Scorpio Sagittarius compatibility may seem like an unlikely partnership. Even at times like a “Beauty and the Beast” type romance, but at their core Scorpio and Sagittarius in love can make quite a compatible pair. They both possess traits that the other needs and both provide for each other in a very complimentary way. That is, if both the zodiac signs don’t let their inadvertent behavior get in the way of their good reason! The key is for Scorpio to think about things a little less, and Sagittarius to think about things a little more. The Sagittarius personality is one of those people who could be categorized as a gentle giant. Often larger than life and a bearer of great knowledge, he or she is not a fighter. Oh, don’t be fooled, the Sagittarius man or Sagittarius woman will definitely bluster, and posture, making you think he or she is a tough person, but underneath it all, our Sag is a teddy bear with a heart of gold. And this teddy bear often gets hurt, taken advantage of or worse, when people find out about his or her kind nature. Enter Sagittarius’ Scorpio lover, center stage. Scorpio personality is another soul who is softer in the inside than he or she is on the outside, but there’s a difference; Scorpio is ruled by Mars and Pluto. Mars symbolizes power and passion. And Pluto on the other hand controls the power of destruction and rejuvenation. These two planets give the Scorpio compatibility its flexibility, despite feeling everything so intensely. To top it off, Scorpio is represented by the scorpion, and we all know what scorpions have…a venom filled stinger. This is a warning to all those who dare harm a Scorpio’s lover. The Scorpio man in love or the Scorpio woman in love will not hesitate to pull out his or her stinger and fight!! And trust me, you will not win against this formidable opponent!! You will lose, and that stinger is not something one recovers from quickly. As important as it is to defend ones place and one’s lover, there is a time and a place for it and Scorpio often doesn’t know when to let go. Scorpio’s stinger can do some considerable damage, but the worse damage they do is to themselves. This is why you need your Sagittarius lover, their kindness and generosity is just what you need, Scorpio. You see, Jupiter, which is the planet of generosity and grandiosity, rules Sagittarius, but more importantly for Scorpio, it is the planet of faith and faithfulness. This can manifest itself as faith in a higher power, as some of the greatest religious figures were Sagittarians. But, this can also manifest itself as faith and faithfulness in their partner. This is just the boost that the Scorpio born needs to feel secure about his or her environment. And with Sagittarius’s grandiosity, comes a need for little attention…well, maybe a lot of attention. Admit it Sag! Oh, this doesn’t make our lovable Sagittarius any less lovable, on the contrary. And devoted Scorpio is more than happy to give the Archer all the attention he or she needs. And speaking of a higher power, the Scorpio Sagittarius in bed have a physical connection that borders on religious. Both Scorpio and Sagittarius sexually thrive on physical contact and affection. And where Sagittarius is warm and loving, Scorpio is steamy and passionate. Both have a penchant for romance and drama; so don’t expect anything less than a performance worthy of Shakespeare in Love! But unlike the movies, this performance as enough real passion to steam the windows! So Scorpio, if you want a partner who is kind, generous to a fault, warm and sincere, who will be faithful until the day you die, choose a Sagittarius partner. Sagittarius, if you want a partner who will be devoted to you, lavish you with attention, and protect you when you need protecting, choose a Scorpio partner. 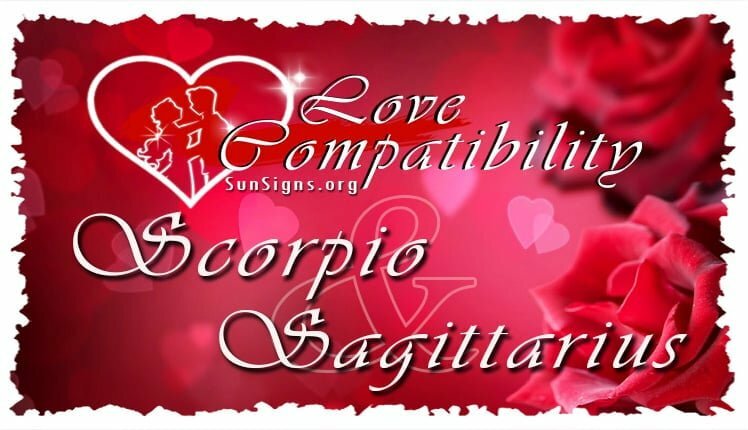 With the Scorpio Sagittarius love compatibility there can be arguments. Most often, they are derived from Sagittarius’s habit of speaking before they think and Scorpio’s habit of overthinking a situation, thus making a mountain out of a molehill. It doesn’t help that Sagittarius is one of the least jealous zodiac signs and Scorpio is one of the most jealous star signs. Sagittarius men or Sagittarius women generally doesn’t mean any harm, but many times they say insensitive, blunt things, because they didn’t think first. They are constantly putting their foot in their mouths. Unfortunate for Sagittarius, the Scorpion is very sensitive when they are spoken to rudely, despite their paradoxically aggressive behavior towards others, sometimes. It drives our prickly Scorpio to lash out. Forgetful Sagittarius, be prepared to be in the doghouse on your partner’s birthday, Valentine’s Day and your anniversary. Unless you mark it on your calendar, you just won’t remember, dreamy Sag. Because to you, the day is not important, it’s the spirit that matters. You think that your spontaneous affection and gifts more than makes up for such a minor blunder, in your eyes. Wrong!! Sensitive Scorpio Sagittarius relationship, the scorpion doesn’t want a late gift. He or she will think the reason you’re late with a gift or have forgotten all together, is because you’re out having an affair. And, when you do buy those flowers, don’t even think about flirting with the girl who sold them to you! This will send the Scorpio into a jealous rage that none of you may recover from! Here’s a cardinal problem with the Scorpio Sagittarius love compatibility. Sagittarius is an outgoing, friendly sun sign who, as we mentioned earlier, loves attention and likes to talk to strangers. This is troubling to our jealous Scorpio, because he or she suspects everything as potential cheating. Paradoxically, this is the furthest thing from Sagittarius’ mind; Sag is a very faithful and devoted sign. But when their goes mad with jealousy, he or she does not see reason, so much so, that they’ll poise their stinger, without thinking that they may hurt the one they love. And Scorpio won’t stop there. They will wage a path of destruction until their lover is ruined, at least in their eyes. This is bad news for the Archer, who is unconsciously chatty and friendly. The core problem of the Scorpio Sagittarius marriage compatibility is the Scorpion doesn’t trust anyone. And because Sag doesn’t mean anything by his or her actions, he or she doesn’t think to reassure their Scorpio lover. If these issues aren’t cleared up, it could lead to years of hurt and misunderstandings and a Scorpio Sagittarius brekaup. So Sagittarius, you need to continually reassure your Scorpio lover that he or she is the apple of your eye, the sun in your solar system, the absolute center of your life, love and affection, regardless of how many people you encounter and give the smallest amount of attention to. And Scorpio, remember that your Sagittarius only loves you and that being friendly is just part of his or her nature and, for goodness sake, put that stinger away! Learn to trust your partner or both of you may get hurt. If the two of you can do this, you will, without a doubt, live happily ever after as the Scorpio Sagittarius compatibility is excellent. You don’t believe me? Well, you did see the ending of Beauty and the Beast, didn’t you?